The AbsoftTools Fortran development environment provides a complete solution for Fortran programming. It simplifies program development and maintenance and increases productivity. One environment supports all stages of development from creating code to debugging it. Key features include: a context sensitive, language aware code editor, Fortran 90 module dependency analysis, and SMP performance analyzer. Mixed language development is enabled though automatic integration with the host system’s C/C++ compilers. 5 Reasons Why the AbsoftTools Fortran IDE is the Best Fortran Solution Available! Absoft solves the problems associated with Visual Studio and Xcode which are excellent environments for C but have no knowledge of Fortran, Fortran debugging nor do they provide a Fortran application framework. 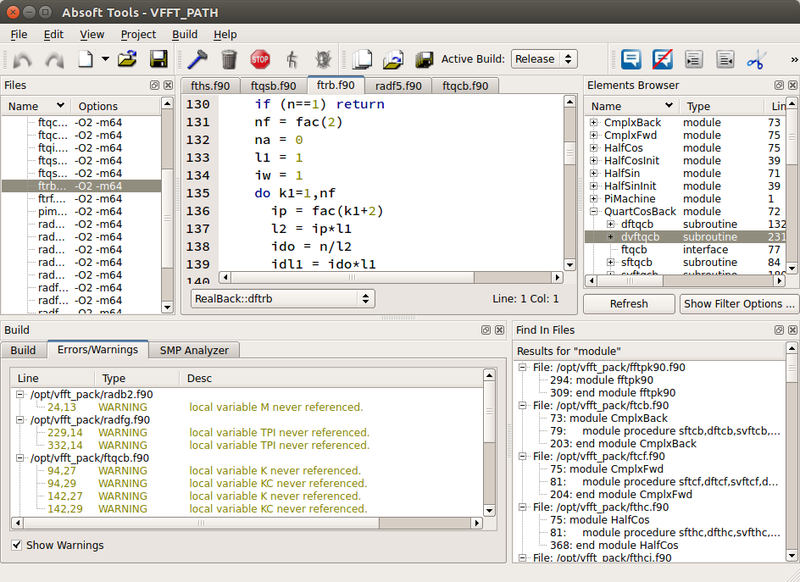 Absoft’s is the only bundled IDE to provide these Fortran resources and full support for C as well. Powerful and ease-to-use, it is excellent for small or large projects and the novice or experienced user. It comes bundled with all Pro Fortran products. Nothing else to buy and no compatibility issues to worry about. Programmer’s editor, compiler, debugger, application framework, math and graphics libraries are included. The editor and debugger know if you are using C or Fortran and adjusts key words, array indexing, etc. accordingly. Building and debugging mixed Fortran/C applications is easy and automated. It is easy to add support for additional open source and commercial third party libraries. The documented XML library package interface makes integrating these libraries simple. Available on Linux, Windows and OS X, it provides the same functionality and a native look and feel on every platform. This means only one learning curve, which saves you time and money and makes the Absoft IDE the best choice for multi-platform developers. View a short video on building a Fortran program with AbsoftTools. D.J. Chadwick, President, SAFE, Inc.